A response matrix is a table of data in which each row represents a participant’s assessment attempt and each column represents an item. The cells show the score that each participant received for each item – valuable information that can help you with psychometric analysis. The Questionmark OData API enables you to create this and other custom data files by giving you flexible, direct access to raw item-level response data. You can already see participant’s item-level response data in Questionmark reports, but the Questionmark reports group data together for one assessment at a time. 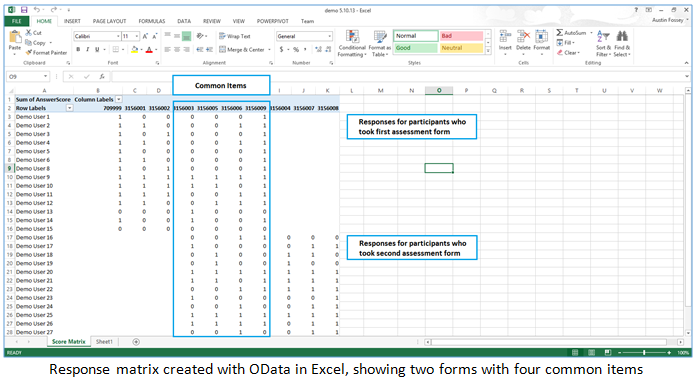 If you have a large-scale assessment design with multiple equated forms, you may want to generate a matrix that shows response data for common items that are used across the forms.